For market indices, round numbers have little more than symbolic meaning. Even so, the Nikkei 225 index’s first close above 20,000 in 15 years is a significant benchmark for Japanese stocks. The last time the gauge scaled that peak in April 2000, it dropped by a third in the subsequent eight months. There are at least three reasons to expect a more cheery outcome this time around. The first reason for optimism is earnings. Profitability is growing more strongly than during the boom of the late 1990s, helped by the cheap yen. The government has given a jolt to Japan’s sleepy corporate governance, prompting fund managers to demand better returns. If Japanese companies can meet investors’ expectations of 11 percent-plus return on equity, the Nikkei could hit 25,000 over the medium term, according to Nomura. That 25 percent upside might be more easily attainable if Prime Minister Shinzo Abe announces a breakthrough in the 12-nation Trans-Pacific Partnership talks during his visit to Washington next week. Greater access to world markets for Japanese manufacturers will complement the low yen and prompt them to invest more at home. To be sure, the equity rally is far from fresh. The Nikkei has risen 136 percent since it became clear that Abe was going to win the December 2012 prime ministerial race and launch a bold campaign to rid Japan of deflation. More than two years into that campaign, the Bank of Japan is still far short of its 2 percent inflation goal. But gloom about deflation is another reason to be optimistic about stocks: the BOJ might crank up money-printing, further lifting returns for investors. As the BOJ has bought more government debt with newly minted yen, Abe has pressured Japan’s state pension funds to switch into equities. Other domestic investors, too, have followed suit. Valuations have undoubtedly run up. On a price-to-earnings basis, the Nikkei is two-fifths more expensive now than in May last year, but still a third cheaper than in April 2013. With three good reasons to bet on a further increase, the Nikkei’s 15-year high looks more like a milestone than a peak. 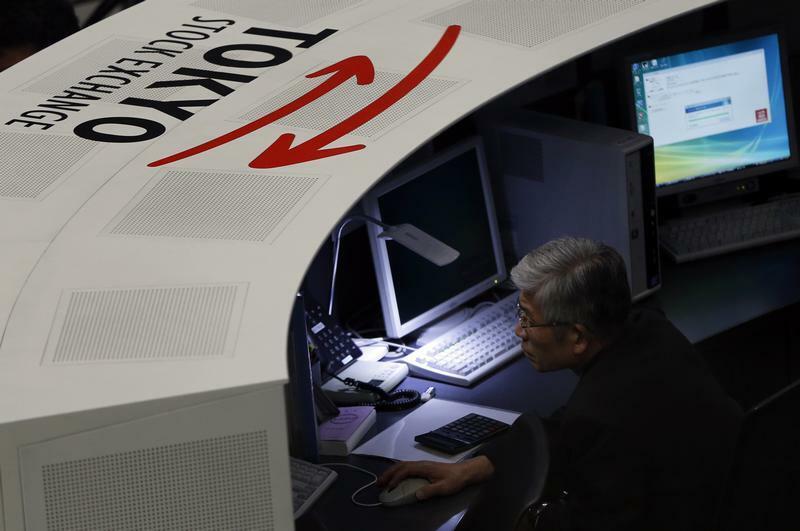 An employee of the Tokyo Stock Exchange (TSE) looks at a monitor at the bourse at the TSE in Tokyo March 3, 2014. The Nikkei 225 Stock Average closed at 20,133.9 on April 22, the first time it had closed above 20,000 in 15 years. The Japanese equity index has gained 40 percent in the past year, and more than doubled since Shinzo Abe became prime minister in December 2012. The last time the Nikkei had closed above 20,000 was on April 14, 2000. By the end of that year, the gauge had lost almost a third of its value. At midday in Tokyo on April 23 the Nikkei was at 20202.1, up 0.3 percent.